The Healthy Diet Paradise is proud to announce our modified oven fried chicken recipe. Not only is this recipe healthy for you, it's really easy to make. Kentucky Fried Chicken, back off! Church's Fried Chicken, step up your game. This oven fried chicken recipe is so close to the real thing, you'll swear you're cheating. This golden brown fried chicken recipe is a ruthless Church's fried chicken copycat. If you're on our hair loss diet, this recipe for oven fried chicken passes muster with flying colors. The picture below showcases large, crispy breasts, thighs, and legs. In our family, legs is the least favorite part of the chicken. For some reason, when you cook the chicken legs this way, the legs or drumsticks become very crunchy and they actually absorb more flavor. They are unbelievable. The best part is legs are a budget saver. Drumsticks or legs are the least expensive cuts of chicken. The first thing you're going to do is get garbanzo bean flour. The best brand is Bob's Red Mill. Also, the yellow garbanzo bean flour causes the chicken to brown into a really beautiful color. When this oven fried chicken recipe is done baking, it tastes exactly the same as pan fried chicken, without the guilt, without the mess, and without the weight gain. Fried chicken that's good for you too. 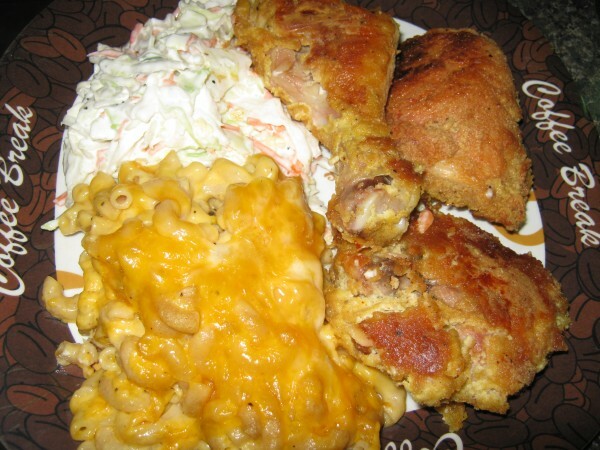 This oven fried chicken recipe can be used for South Beach Phase II diet, or Atkins phase II diet. You can use any spices you wish. I'm going to give you the spices we used, and you can take it from there. First, crack the eggs into a bowl and scramble well. Take the garbanzo bean flour and put it into another bowl. Set it to the side. Take paprika, pepper, seasoned salt and garlic, and mix it in with the flour. You can add extra depending on your tastes. Take your chicken pieces and drop a few at a time into the eggs. Make sure the egg mixture fully covers the chicken. Once the chicken is covered with raw egg, place the chicken pieces into the bowl with the flour and spices. Cover the chicken with a lid or a plate, and aggressively shake the chicken to make sure it's completely covered with the flour. Repeat this process until all of the chicken is covered with flour. Gently place the pieces of chicken onto the flat cooking sheet. Bake at 380 for one to one and a half hours, depending on the size and cuts of your chicken. If you bake the chicken at a higher temperature, it may burn the outside and cause the inside not to cook as fast. If you're going to use breasts, make sure you set aside about an hour and a half. Chicken breasts take longer to brown. It's easier to start with dark cuts of meat. Even if you don't like dark meat, you are going to fall in love with this. The dark pieces come out crunchier, and the crispy texture will make a convert out of breast and wing lovers. Then as you get used to it, you can work with larger pieces of chicken, and weigh which one works better for you. Here's a quick tip for cole slaw: One bag of shredded cabbage and carrots, one teaspoon of vinegar, salt and pepper, 2/3rd cup of regular ranch dressing. Stir well. When the oven fried chicken recipe is done, your house will smell like a restaurant. People will say, "What on earth are you cooking?" And then start hinting and hanging around trying to grab a piece. Seriously, this is really delicious. I really hope you love this. 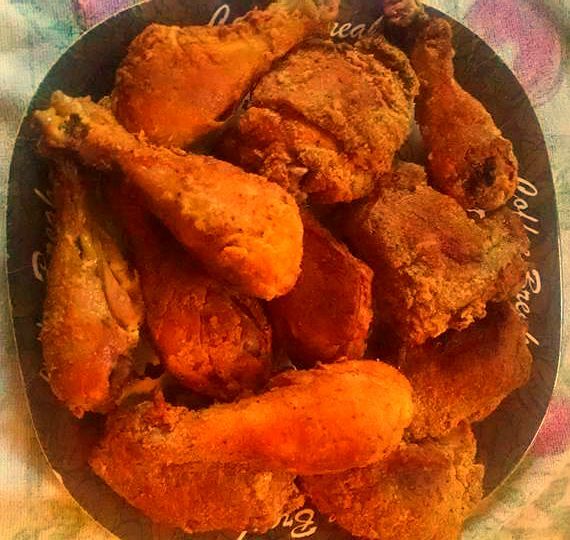 Let me know how you like this fried chicken recipe!